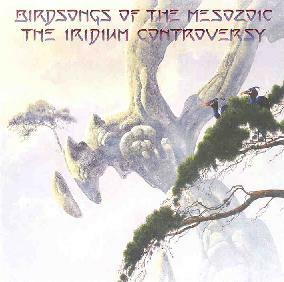 Birdsongs Of The Mesozoic - "The Iridium Controversy"
Boston based Birdsongs Of The Mesozoic (BOTM) have come a long way since their 1980 beginnings as a side project of Mission Of Burma's Roger Miller. Their latest release, The Iridium Controversy, is a worthy successor to their Petrophonics CD, which was one of progressive rock's shining lights in 2000. The quartet still consists of Erik Lindgren on piano & organ, Ken Field on saxophones, flute & percussion, Rick Scott on synthesizer, piano & percussion and Michael Bierylo on guitar, along with several guests including founder Roger Miller on two tracks. The music on The Iridium Controversy is a primordial stew of Canterbury, avant-prog, jazz and classical influences. The Art Bears certainly come to mind, and there are moments of intensity that recall Present, particularly due to the Alain Rochette piano style that crops up from time to time. But there's also a lighthearted and whimsical feel... almost carnival like... that pervades throughout, though BOTM can rock out when they want to as well. I love the combination of horns, piano and guitar that is such an integral part of the BOTM sound. While the sounds and stylings may be recognizable, it's the imaginative and flawlessly executed compositions that present the music in a fresh light that BOTM can call their own. All the complexities of progressive rock are present, though the music rolls along at such a smooth pace, transitioning seamlessly through its many and varied themes, that the listener is welcome to either examine the complexity of the compositions or simply enjoy a set of damn good music that is challenging yet highly accessible. And the music flows steadily from one track to the next, making this very much an "album" that should be listened to in its entirety. In summary, BOTM have once again demonstrated that progressive rock can still be exciting and jam packed with action and adventure. And as if to highlight that point... it's got a Roger Dean cover!! For more information you can visit the Birdsongs Of The Mesozoic web site at: http://www.birdsongsofthemesozoic.org. The Iridium Controversy is distributed by Cuneiform Records. You can visit their web site at: http://www.cuneiformrecords.com.